Continuing with our analysis of Psalm 104, we soon discover that the exegetical evidence favors a change of topic at verse 6. The transition commences with mere implications–a delicate poetic transference that gradually prods the reader into a different direction. While arguments can be made to retain the topic of Creation, David takes the readers on a journey that begins with creation, but continues into a time between Creation and the present before bringing them into their own context in time. Subtle uses of both vocabulary, phraseology, and syntax make the excursion a continual delight. 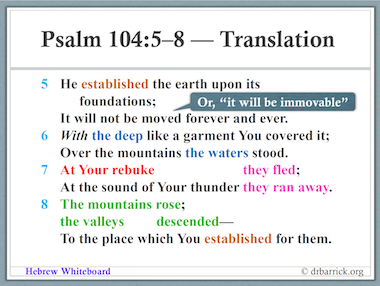 Click on Hebrew Whiteboard to download Psalm 104:1-8 or any of the previous studies of Psalms 1-6 and 120-122.